Mobile DHI is the convenient way to view all your herd information from your test day reports. Get instant access to your herd dashboard displaying key information on production, reproduction and herd health. View complete cow and heifer lists, and profile pages for each animal. From each profile, you can directly link to Holstein Canada and Canadian Dairy Network pages. 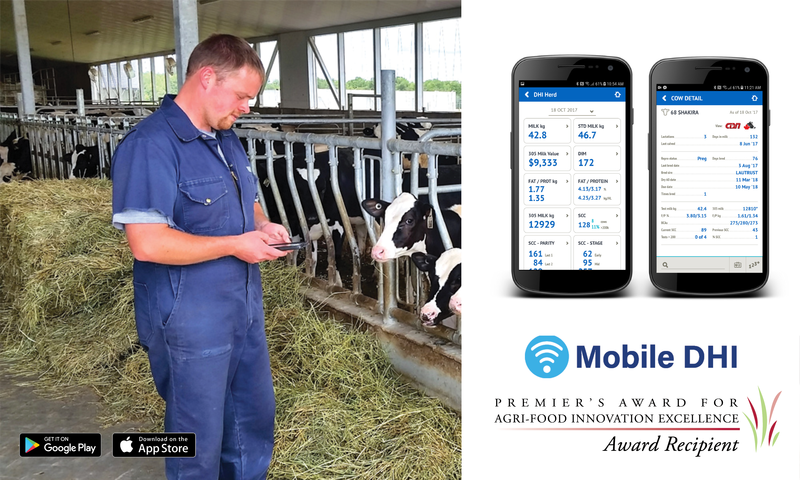 Mobile DHI gives you herd trend insights which leads to better management decisions and supports short and long term planning on your dairy. Instead of carrying around years of paper information on your herd’s performance and health, Mobile DHI keeps it handy all in one secure spot. Simple: Quickly review vital information on your herd through over 25 different key parameters. With colourful graphs, and easy swipe navigation, Mobile DHI makes it easy to keep tabs on all your animals. Customizable: Within your cow and heifer lists, Mobile DHI allows you to customize which data fields you would like to see and can be based on the management information relevant to you. Sort by repro status, DIM, SCC, milk value, and many more. Secure: All of the herd data comes from your test day data, which is stored on our secure server. Even if you break or lose your phone, your information can be quickly recovered. Search: Find cow and heifer data easily - no more flipping through pages. Look up individual animals or sort heifers and cows into lists. For example, find all highest contributing SCC animals. Direct Link: Each animal has direct links from their profile on Mobile DHI to their profiles on Holstein Canada and Canadian Dairy network, making it easier than ever to look up pedigrees and make breeding decisions. Accessible: Multiple users can be set up to access your herd data. Your advisor team can also use Mobile DHI to check up on your herd between visits. Test Day Data: Check up on your MUN results, Ketoscreen, Milk Preg Test, and SCC. Also view production history, milk value, BCA’s, due dates and much more. 1. Download Mobile DHI to your phone. Available for both Android and Apple customers. 2. Simply contact DHI to enroll. Monthly fee applies for use. Login details will be given to you.